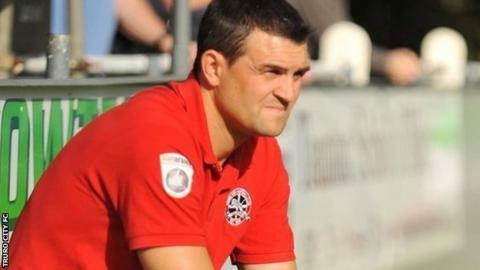 Truro City boss Steve Tully says he is "really disappointed" that his side's National League South game at Havant & Waterlooville was postponed. His team had arrived in Hampshire by the time the match was called off, around 90 minutes before kick-off. The Cornish club must now play seven games in 18 days as they look to secure a play-off place. "Postponements can come back and kill you and it's definitely going to hamper us now," Tully told BBC Radio Cornwall. "We've got games in hand but when you've got to play Saturday, Tuesday, Thursday, Saturday - that's four games in a week and for any squad you'll struggle." Truro are fourth and have played fewer matches than any team in the division. They have had three games called off in the past two weeks and host Weston-super-Mare at Treyew Road on Tuesday. "We're really disappointed with the outcome, I was disappointed with the attitude of the referee because he didn't even want to give us time to even play it," added Tully. "There was a heavy downpour and there was water on the pitch when we got there, but within 20 minutes the rain had stopped and the pitch was drying out. "A little bit of common sense by putting the game back by half an hour, or an hour, and both parties would have been happy to play the game."